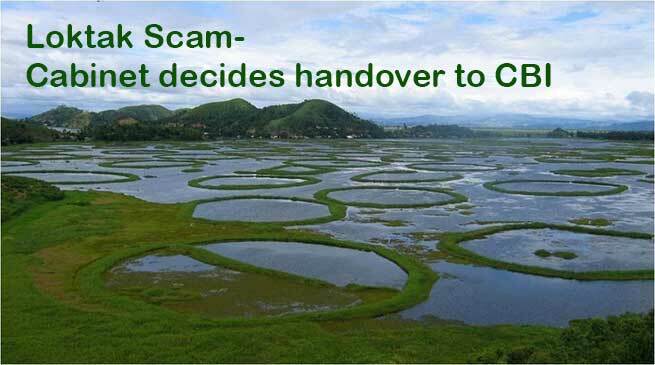 The State Cabinet on Friday unanimously resolved to handover the case of Loktak scam to CBI. The cabinet meeting was chaired by Chief Minister N. Biren Singh. The Cabinet meeting which lasted about three hours was held at District training centre hall in the hill town of Churachandpur and was attended by Cabinet Ministers. After thoroughly examining the projects taken up under Border Area Development Programme (BADP), the State Cabinet also resolved to review the mode of implementation in order to ensure a visible change in the Central Government-sponsored programme. The Cabinet also decided to open District Transport Office at Moreh besides engagement of 32 drivers (30 heavy and two light) and 27 handymen on casual basis for the smooth running of the Manipur State Transport. It also decided to fill up seven vacant posts (staff) for Manipur Human Rights Commission (MHRC). Enhancement of upper age limit/entry of age from 62 years to 67 years and maximum age for tenure of service from 65 years to 70 years for the post of JNIMS Director was also approved. The State Cabinet also gave its nod to creation of one post of Public Relations Officer (PRO) in the Governor’s Secretariat, Raj Bhavan, Imphal apart from approving the proposal for re-designation of Media Consultant to the Governor as Officer on Special Duty (OSD) with the increase of special allowance from Rs 15,000 to Rs 30,000.